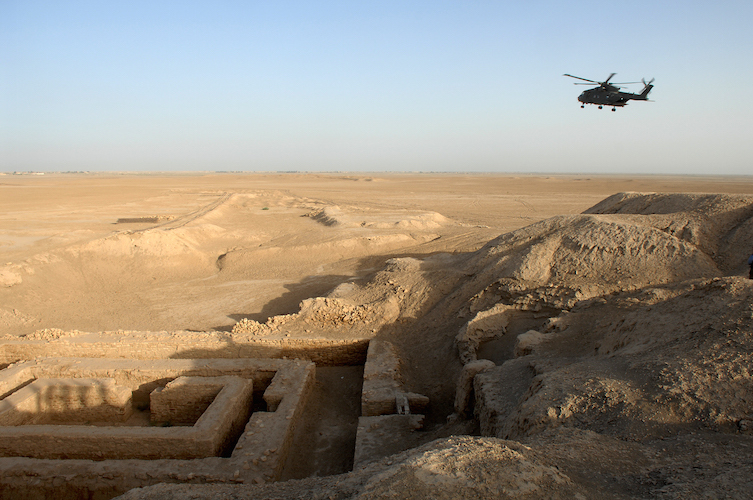 Uruk (modern Warka in Iraq)—where city life began more than five thousand years ago and where the first writing emerged—was clearly one of the most important places in southern Mesopotamia. 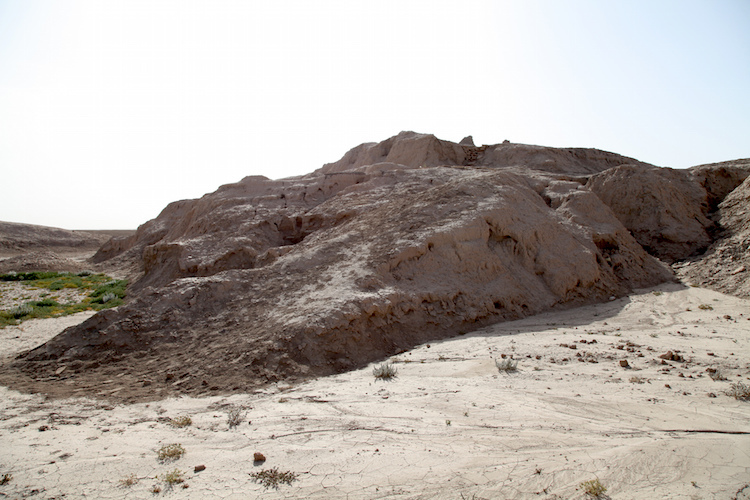 Within Uruk, the greatest monument was the Anu Ziggurat on which the White Temple was built. Dating to the late 4th millennium B.C.E. (the Late Uruk Period, or Uruk III) and dedicated to the sky god Anu, this temple would have towered well above (approximately 40 feet) the flat plain of Uruk, and been visible from a great distance—even over the defensive walls of the city. A ziggurat is a built raised platform with four sloping sides—like a chopped-off pyramid. Ziggurats are made of mud-bricks—the building material of choice in the Near East, as stone is rare. Ziggurats were not only a visual focal point of the city, they were a symbolic one, as well—they were at the heart of the theocratic political system (a theocracy is a type of government where a god is recognized as the ruler, and the state officials operate on the god’s behalf). So, seeing the ziggurat towering above the city, one made a visual connection to the god or goddess honored there, but also recognized that deity’s political authority. Excavators of the White Temple estimate that it would have taken 1500 laborers working on average ten hours per day for about five years to build the last major revetment (stone facing) of its massive underlying terrace (the open areas surrounding the White Temple at the top of the ziggurat). Although religious belief may have inspired participation in such a project, no doubt some sort of force (corvée labor—unpaid labor coerced by the state/slavery) was involved as well. The sides of the ziggurat were very broad and sloping but broken up by recessed stripes or bands from top to bottom (see digital reconstruction, above), which would have made a stunning pattern in morning or afternoon sunlight. The only way up to the top of the ziggurat was via a steep stairway that led to a ramp that wrapped around the north end of the Ziggurat and brought one to the temple entrance. The flat top of the ziggurat was coated with bitumen (asphalt—a tar or pitch-like material similar to what is used for road paving) and overlaid with brick, for a firm and waterproof foundation for the White temple. The temple gets its name for the fact that it was entirely white washed inside and out, which would have given it a dazzling brightness in strong sunlight. The White temple was rectangular, measuring 17.5 x 22.3 meters and, at its corners, oriented to the cardinal points. 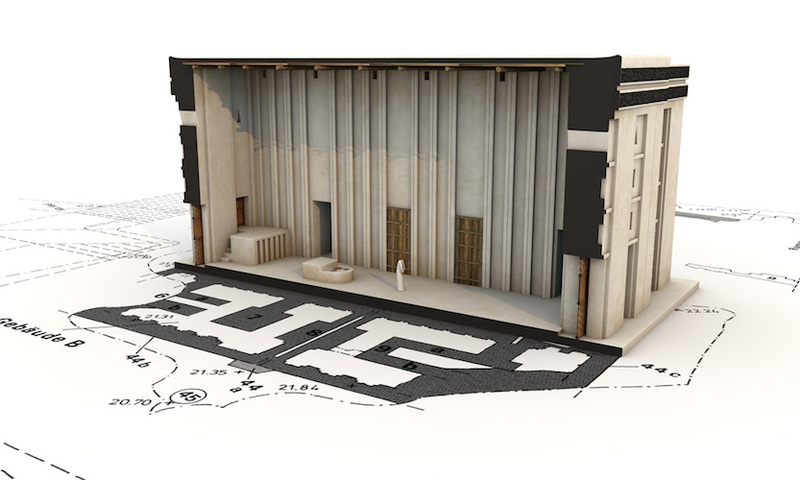 It is a typical Uruk “high temple (Hochtempel)” type with a tri-partite plan: a long rectangular central hall with rooms on either side (plan). 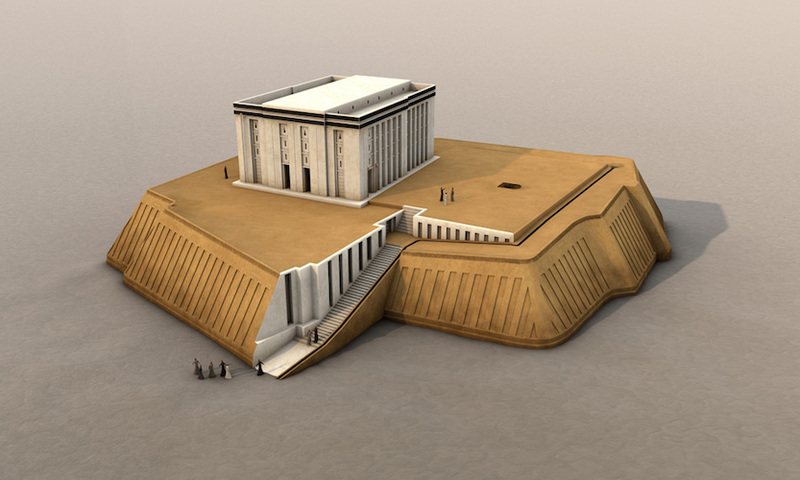 The White Temple had three entrances, none of which faced the ziggurat ramp directly. Visitors would have needed to walk around the temple, appreciating its bright façade and the powerful view, and likely gained access to the interior in a “bent axis” approach (where one would have to turn 90 degrees to face the altar), a typical arrangement for Ancient Near Eastern temples. The north west and east corner chambers of the building contained staircases (unfinished in the case of the one at the north end). Chambers in the middle of the northeast room suite appear to have been equipped with wooden shelves in the walls and displayed cavities for setting in pivot stones which might imply a solid door was fitted in these spaces. 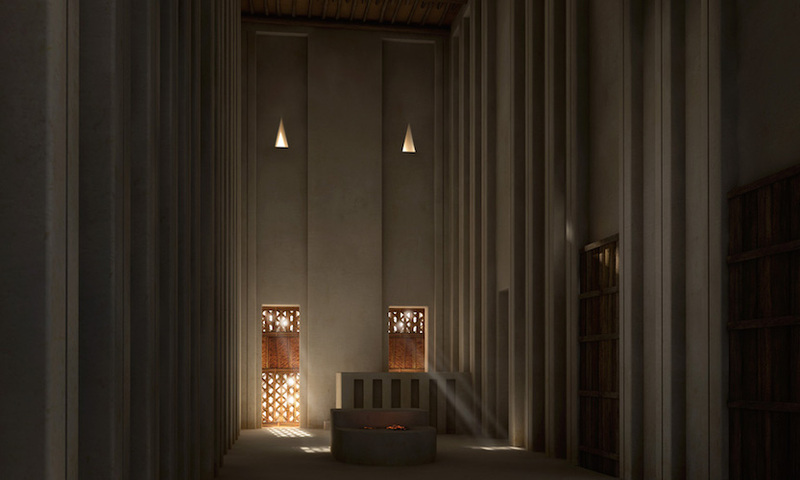 The north end of the central hall had a podium accessible by means of a small staircase and an altar with a fire-stained surface. Very few objects were found inside the White Temple, although what has been found is very interesting. 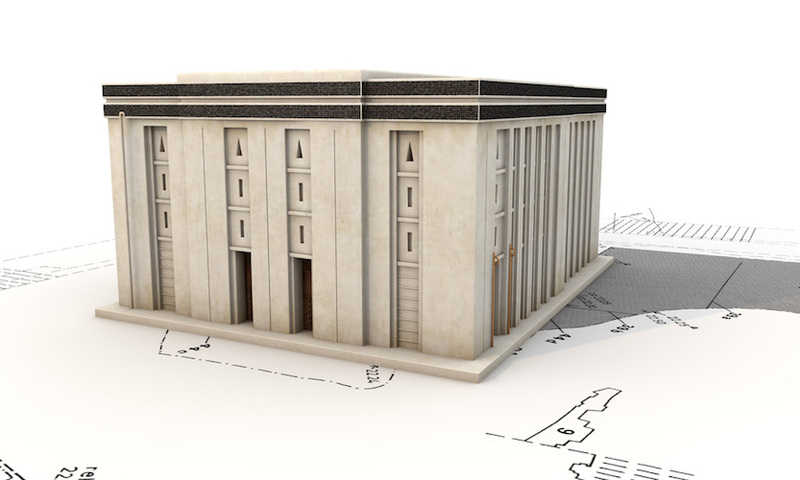 Archaeologists uncovered some 19 tablets of gypsum on the floor of the temple—all of which had cylinder seal impressions and reflected temple accounting. Also, archaeologists uncovered a foundation deposit of the bones of a leopard and a lion in the eastern corner of the Temple (foundation deposits, ritually buried objects and bones, are not uncommon in ancient architecture). To the north of the White Temple there was a broad flat terrace, at the center of which archaeologists found a huge pit with traces of fire (2.2 x 2.7m) and a loop cut from a massive boulder. Most interestingly, a system of shallow bitumen-coated conduits were discovered. These ran from the southeast and southwest of the terrace edges and entered the temple through the southeast and southwest doors. Archaeologists conjecture that liquids would have flowed from the terrace to collect in a pit in the center hall of the temple. Cite this page as: Dr. Senta German, "White Temple and ziggurat, Uruk," in Smarthistory, August 8, 2015, accessed April 21, 2019, https://smarthistory.org/white-temple-and-ziggurat-uruk/.